Purpose : Natural orifice transluminal endoscopy surgery is a ideal technique that aim at reducing skin incision and post operative care. The purpose of this study was to analyse operative and long term results of a series of hybrid transvaginal cholecystectomy. Material & Methods : Between May 2007 & June 2009, transvaginal NOTES cholecystectomy for symptomatic cholelithiasis wasperformed by a hybrid technique with conventonal instruments in 36 women.Mean age was 52 years. Results : There was no major complication during transvaginal approach with 2 conversions. The ovrerall mean duration of the procedure was 75 minutes.The mean follw up was 12 months ranging from 3-26 months and none of the patients have complained of dyspareunia or other vaginal or pelvic complication. Conclusion : Hybrid Transvaginal cholecystectomy is a safe and cosmetically better approach with minimal post operative discomfort. 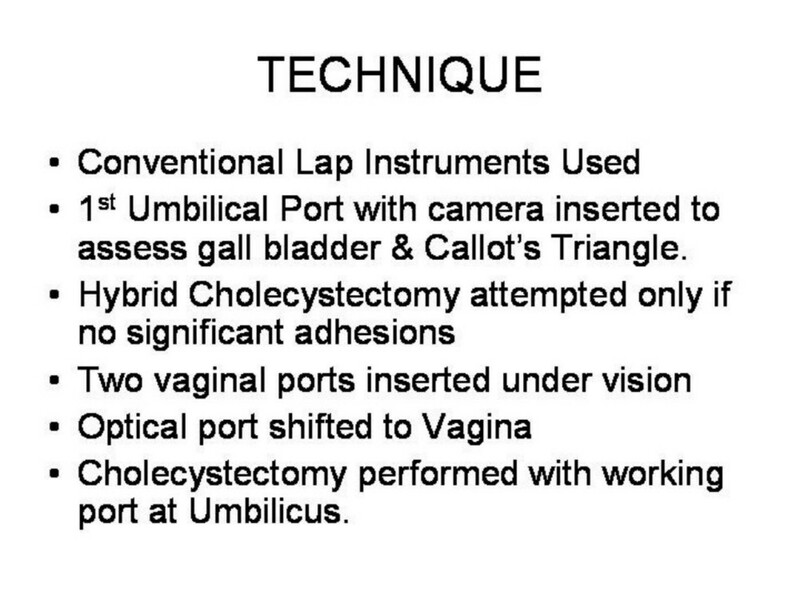 It can be performed in surgical setting where laparoscopy is practised regularly ,using conventional instruments.Thus hybrid transvaginal cholecystectomy is a good surgical combination of NOTES and minilaparoscopy.